Blues is My Middle Name: "We're all in this Together"
I must warn you now that this post is going to be a rant. It's been building up for months, and I've just come across the proverbial straw that breaks the camel's back. What possibly can have triggered this reaction in one so normally phlegmatic? For many, it won't seem much, as they will be unaffected by it. For millions of others, particularly pensioners, it will be yet another nail in their coffin. My attention was drawn to the Government's 'DirectGov' web site, and the information contained there that this year, the Winter Fuel Payment will be reduced by at least 20% (though this was quietly mentioned as part of this years budget apparently, but I missed that). I'll explain my fury at this piece of social injustice as we proceed, but for now, let's put it in the context of David Cameron's persistent declaration that, "We're all in this together". The cartoon above underlines the crass stupidity of this statement, and is an insult to the thinking man and woman in the street. There's a bit of history to this statement from David Cameron. In the Conservative Party Conference of October 2009, the last year of being in Opposition, he said to the faithful that he wouldn't make promises that he couldn't keep, but that "We will get through this together". He also told the tear-jerking story of two pensioners, concluding with, "Pensioners don't want pity. They just want to know that if they've lived responsibly, they'll be looked after in their old age". In 2010, the party Conference slogan was "We're all in this together". 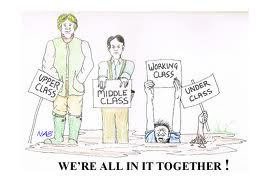 And at the 2011 party Conference, Cameron repeated, "We are all in this together". So the phrase has history, and gives the impression that we are one nation, standing together, suffering together for a better future. But it is a lie to say that we are all in this together. Some are up to their ankles in it; others their knees; others their waist; still others their necks, while many are in it over their heads. The worst off are pensioners and the low paid. If I happen to mention personal matters, it will simply be for illustrative purposes, and not to draw attention to my situation, as there are millions of people far worse off than I am. I could draw attention to the plight of many in our society, but I'm going to stick with one group - the pensioners. Many pensioners are of course reasonably well off; they've done well in life, and good luck to them. The majority however, are in a totally different situation. I said that the trigger for my ire was the reduction in this years Winter Fuel Payment (WFP). For those who meet the age qualifications, this is a payment received in November or December each year; it is non-taxable, and is not means-tested, meaning that as long as you meet the age-related requirements, you get the payment, no matter what your income is. So the pensioners living solely on state benefits get the same amount as the eligible millionaire. In the last year of the Labour Government, they increased the WFP to £250, and to £400 for those over 80 years of age. The Coalition Government in their first year agreed to keep the amounts the same. This coming winter however will see the amounts change. For the over 60's, the payment will drop from £250 to £200 (a reduction of 20%), and for the over 80's, the payment will drop from £400 to £300 (a reduction of 25%). This however is not simply a discussion on pure economics; it is one about life and death. The picture above is not designed for emotional blackmail; it is the harsh reality in the lives of millions of pensioners - having enough money to heat their homes. The Pensioners Coalition says that since the winter of 2007, over "300,000 pensioners have died during the winter months because of cold-related illnesses". Winter Fuel Payments are all that stands in the way of many more people dying. It cannot be underestimated how important this winter payment is, and reducing it now, gives lie to Cameron's pre-election promise to pensioners that under the Conservatives, "they'll be looked after in their old age". This reduction in WFP's of 20% - 25% is a gross piece of social injustice, as it comes at the same time of soaring fuel bills in the UK. Scottish Power has led the way with gas and electricity price rises well above the rate of inflation, and others will follow suit. But it's all so different in other countries. The map above graphically shows the difference between the UK and other European countries. While gas and electricity prices in the UK are expected to rise by an average 18% and 11% respectively, other European countries are capping their prices. A Sunday Mirror investigation has found that in France, electricity bills have gone up 3%, and gas by 0%. In Spain, electricity firms have been banned from raising prices by more than 1.5%, with gas at 0%. In Germany, gas price rises are being held at 11%, and electricity at 0%. In Italy, both gas and electricity are held at 0% increase. It should be noted that the big energy companies such as Scottish Power, npower, E.ON and EDF are all owned by foreign firms from Spain, Germany and France. Together they supply energy to around 11 million households in the UK (according to the latest 2008 figures from the ONS, there are about 21.7 million households in the UK). UK energy watchdogs fear that foreign-owned energy firms are pushing up our bills to subsidise their own countries. The energy firms of course deny this. astronomical increases, while countries like France, Germany, Spain and Italy have Governments that control them? The price comparison web site Energyhelpline.com has said, "UK consumers will want to know why the Government or regulator Ofgem hasn't done more". Quite right. To make matters even worse, David Orr says of these price increases in the UK, "These hikes will leave the most vulnerable with a stark choice between heating and eating. Yet the Coalition is planning to remove the energy regulator's duty to protect low-income customers and abolish their champion Consumer Focus. 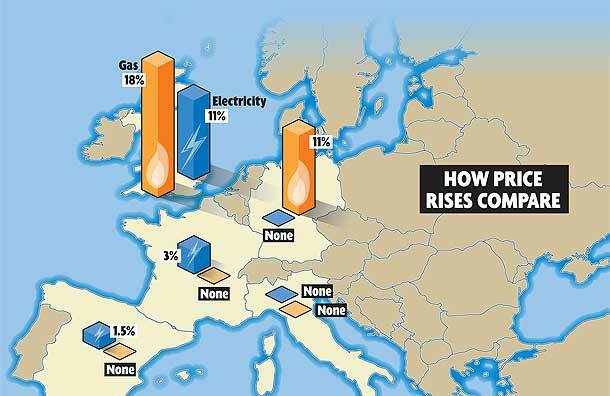 Instead of scrapping the only protection customers have, we should regulate energy prices like the rest of Europe". Yes, the choice for many pensioners in 2011/2012 will be between heating and eating. This is just not good enough in the United Kingdom of the 21st Century, and is a shame on our so-called civilised society. To add to these fuel cost increases, think of the pensioners on Pension Credit and in receipt of Housing Benefit. This year, my Pension Credit went up by about 4% (around £5 a week), and next April my Housing Benefit will be reduced by about 8.2% (around £9 a week). This means that for rent alone I'll have to find another £39 a month, given that the rent doesn't go up, on top of £100 a month paid to top-up my Housing Benefit. Food prices are also going through the roof, and I can only be grateful for the free travel pass for local buses. At least we can get around for nothing. Those fortunate enough to have a little savings are seeing interest at 0.5%, which means that they can look forward to 50 pence interest paid on £100 in the bank. Break out the champagne someone. The net financial situation for most pensioners is a deficit one, and this is a despicable thing. But, who the hell cares? Cameron was right on one thing in 2009, "Pensioners don't want pity". We do however want dignity, the ability to pay our bills, and have a reasonable standard of living. We don't want to have to decide, Heat or Eat? It's certainly time that the Government stopped letting privatised energy companies call the shots. Take a stand Mr Cameron, for it's the poorest in the land who end up paying. For those politicians, leaders and others who like to spout the Bible at every opportunity, perhaps you would do well to be reminded of the story of the widow's mite. You can read it here. Nothing like a good rant, John! But as usual spot on. To make you even more apoplectic did you read the comment from David Davis at the Tory conference last week? Davis was speaking to a "fringe meeting" and said that It is a Conservative principle "to have no limits on how low a person might fall". That is truly Dickensian and for me has shades of the workhouse! But, as it commented in the Guardian, his "well heeled audience, with all their money, influence and connections would never have to live the principle themselves". Finally, I thought your little cartoon at the top of your blog reminded me both visually and by implication of the old "Two Ronnies" sketch: "I'm upper class and I look down on him........" I'm sure that you remember it.